EUR/USD has pared some of the loss made previous week. Markets focus is on Donald Trump-Putin summit meeting to be happened in Helsinki. The main agenda of the meeting is regarding Ukraine, Syria, sanctions and trade are on the agenda. US dolalr was trading stronger in previous week on account of escalating trade war. Markets eye US retail sales data which is to be released toay for further direction. The flattening of US yield curve is putting pressure on USD. The spread between 2 year and 10 year yield is at 25 basis point lowest level since Aug 2007. US 2year yield has posted biggest weekly jump in a month. 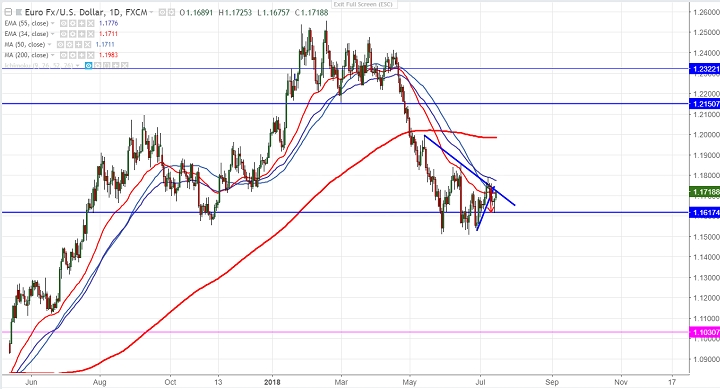 EUR/USD’s near term support is around 1.16500 (20- day MA) and any break below will drag the pair to next level till 1.1600/1.1500.Any break below 1.1500 confirms minor weakness and decline till 1.1400/1.13600 is likely. On the higher side, near term resistance is around 1.1750 (50- day MA) and any break above will take the pair to next level till 1.1795/1.1850/1.1900. It is good to sell on rallies around 1.1735-40 with SL around 1.1795 for the TP of 1.1600/1.1500.